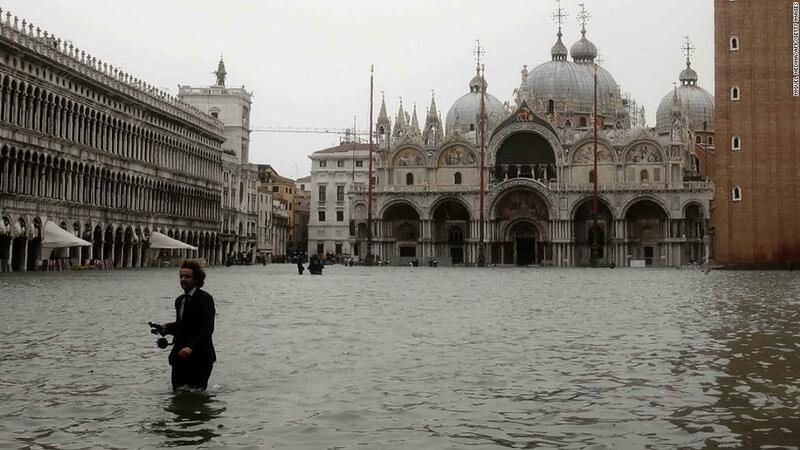 Much of Venice was engulfed with water on Monday after high tides and strong winds caused the worst flooding for years, transforming the vast expanse of St. Mark’s Square into a lake and spilling across ancient marble floors in St. Mark’s Basilica. 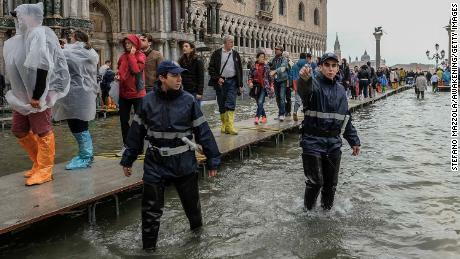 The floodwaters covered several dozen square meters of the 1,000-year-old marble pavement in front of the altar of the Madonna Nicopeia, a 12th-century icon, and submerged the Baptistery and the Zen Chapel, he said. Mosaic flooring near the entrance to the basilica was under as much as 90 centimeters (35 inches) of water for 16 hours, which also soaked the monumental bronze doors, columns and marbles, Tesserin said. “The church has a structure made of bricks which, drenched in salt water, deteriorate even to a height of several meters, endangering the mosaics that adorn the vaults,” he said. 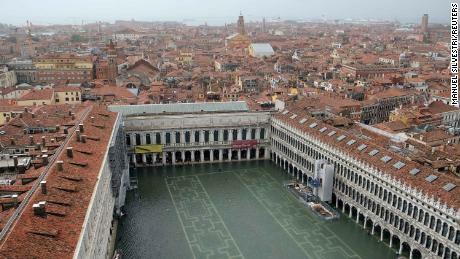 As the floodwaters rose Monday, reaching 156 centimeters (61 inches) above average sea level at their peak, as much as three-quarters of Venice was submerged. Raised walkways were laid out in front of the Doge’s Palace and other parts of the city. 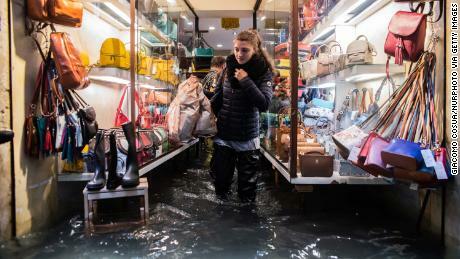 Tourists and residents trudged through the waist-high water, while stores and restaurants were inundated as barriers placed across doorways failed to hold back the rising tide. Shopkeepers used buckets to remove water from their premises. 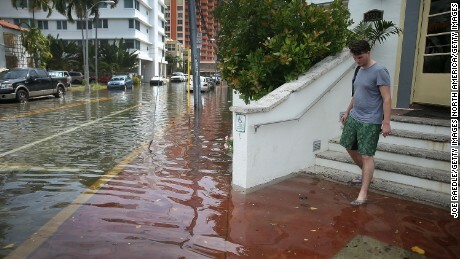 Tuesday’s high tides peaked at 110 centimeters, a level that would inundate at least 12% of the city. On Wednesday city authorities were expecting 90 centimeters maximum, with a peak of 110 centimeters forecast again on Thursday. Floods of at least 110 centimeters usually happen only about four times a year. The highest ever recorded was 194 centimeters in November 1966. 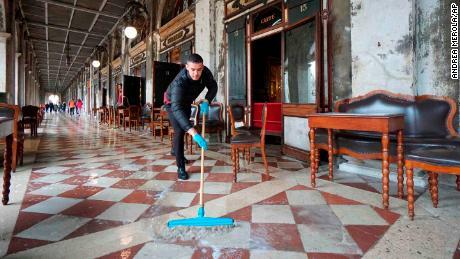 “Everything is under control, just as it was last Friday,” a spokesman for the office of Venice Mayor Luigi Brugnaro told CNN on Wednesday. Other parts of northern Italy have also been affected by high winds, heavy rainfall and violent storms this week. The Liguria, Veneto, Trentino and Friuli-Venezia Giulia regions were the hardest hit, according to the Civil Protection Agency. The popular resort town of Portofino, on the Ligurian coast, has been left isolated after the road linking it to the nearby town of Rapallo was destroyed, Jacopo Riccamboni of the Rapallo town press office told CNN. A yacht belonging to the family of former Prime Minister Silvio Berlusconi moored in Rapallo was also damaged, he said. “We had a sort of tsunami, eight-meter waves. I have never seen such a thing here,” he said. Rescuers were also working Wednesday to evacuate more than 190 people stranded by heavy snowfall at the Stelvio Pass in South Tyrol, the Civil Protection Agency said. An Albanian fisherman died in the Trentino-Alto Adige region after strong winds blew him into the water as he tried to secure his boat on Lake Levico, the agency said Wednesday. 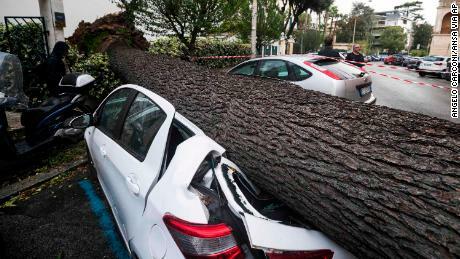 Two young people died south of Rome when a tree hit their car, while another person was killed in the nearby town of Terracina as winds brought down scores of pine trees. Among the other victims was a 21-year-old man who was hit by a falling tree while walking in Naples, and a woman who died after being struck by debris blown off a building in the northern region of Liguria. A volunteer firefighter who was helping with the emergency response in San Martino in Badia in the country’s north is also reported to have died. 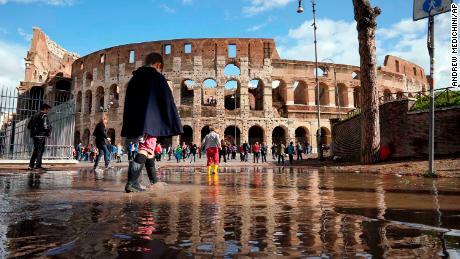 CNN’s Valentina DiDonato reported from Rome and Gianluca Mezzofiore from London, and Laura Smith-Spark wrote from London. CNN’s Judson Jones contributed to this report.